Clark NJ – Now FM approved FireChek® thermal shutoffs with resettable memory shape alloy can be used to automatically shut down a pneumatic control system when a nearby fire occurs, or when the ambient temperature reaches 135, 150, or 165°F. The testability and reset ability of the FireChek makes it a preferred choice over emergency isolation valves that rely on fusible links or plastic burn-through tubing. When the FireChek senses excessive heat from a nearby fire, it immediately closes the air supply line preventing the air from feeding the fire. It simultaneously vents the spring return actuator to allow the return to fail-safe. The FireChek triggers quickly, securing pneumatically operated process line valves in their fail-safe position for both on/off and throttling applications. Because FireChek responds to heat, not flame, it offers dramatically improved protection compared with conventional plastic tubing burn-through. The shape memory element senses the ambient temperature and, through a phase induction change, rapidly produces the force and motion to trigger the FireChek. The element is 100% reliable because the shape memory effect is intrinsic to the alloy. Shape memory alloys have performed successfully for many years in military, industrial, and consumer product applications. 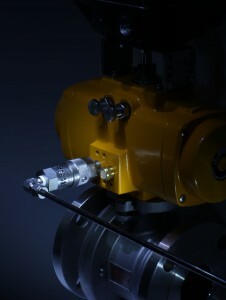 The single FireChek is directly mounted between the pneumatic supply and spring return actuator via two NPT threaded connections. While the FireChek itself is extremely well suited for the vast majority of pneumatic actuators with ¼” air supply input ports, the FireChek PLUS can be used very effectively on larger pneumatic actuators. The FireChek with Quick Exhaust provides a larger exhaust port. When the emergency operation is triggered by excessive heat, the actuator exhaust air is diverted to a larger port by the Quick Exhaust valve. 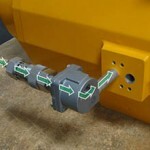 This allows for the spring return actuator to move to the fail-safe position much faster. The FireChek PLUS assembly combines the FM approved FireChek thermal shutoff with a SIL Class III pilot valve, either with or without a solenoid operator. The FireChek PLUS assemblies are available with either a piped connection to the actuator, or with a NAMUR mounting interface for direct mount of the pilot to the actuator. FireChek PLUS models are available for actuators with port sizes from1/4” to 1” to accommodate most pneumatic actuators. The FireChek is used in both batch and continuous process systems as found in oil refining, paper manufacturing, chemicals, pharmaceutical and power plants. Upgrades to the more efficient, more economical, and testable FireChek thermal shutoffs do not affect normal plant operations or the normal function of the control valve. Upgrades are simply achieved by installing the FireChek components into the existing control valve’s pneumatic air line. This entry was posted in Emergency and Fire Safety Valves and Devices, Latest News and tagged fire check, firecheck, FireChek, FireChek Plus, FireChek Quick Exhaust. Bookmark the permalink.